These photographs come from the files of the Philadelphia Inquirer and Daily News. 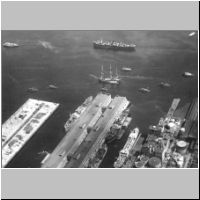 Thanks to Michael Panzer, head of the PNI Library, for allowing me access to these images. Most were taken in the 1950s and 1960s by SkyPhotos of Stratford, New Jersey. Some photos bear the wax pencil markings used to indicate how they were cropped for publication. 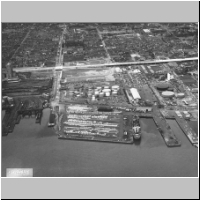 Most of the piers pictured in these photographs are no longer in commercial use; a number have been converted for use as residential dwellings or entertainment centers. 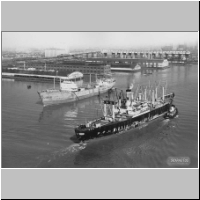 [First published caption, 1/9/1937] A typical scene in the Port of Philadelphia, which J. Hampton Moore says is the city's greatest wonder -- and who should know better than that foremost exponent of inland waterways. Through this port pass the products of one of the world's greatest industrial centres. 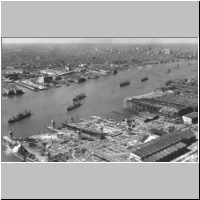 [Second published caption, 10/13/1940] Great ports, like Philadelphia (above), might be vitally affected by Hitler's scheme. 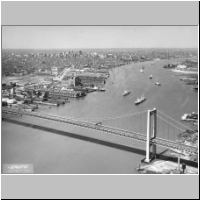 [This photograph seems to have been taken on 2/24/1932, and published twice, on 1/9/1937 and 10/13/1940.] 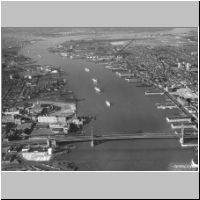 Edward S. Wood, Jr. Aerial Photography. 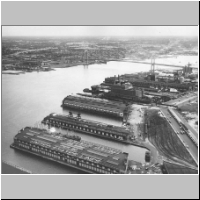 Ardmore, Pa.
[Piers north of Benjamin Franklin Bridge along Delaware River] 1954. Skyphotos. 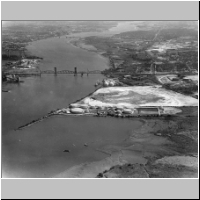 106 acre site just south of DelAir Railroad Bridge [along the Delaware River on the New Jersey side. 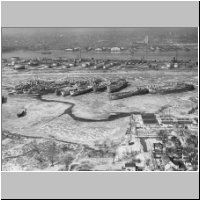 Site was used as depository for material dredged from river.] 1964 ca. 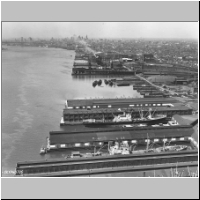 [Delaware River looking north from South Philadelphia to Benjamin Franklin Bridge. Philadelphia and Camden.] 1964 ca. Looking up [Delaware] River. 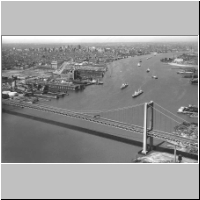 Benjamin Franklin Bridge in foreground. [Petty's Island]. View No. S-1379-11 Date July 1 1965 by Skyphotos. 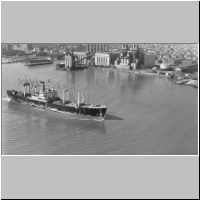 [Delaware River scene: South Philadelphia piers, Walt Whitman Bridge, New Jersey in background] 1966. Skyphotos. 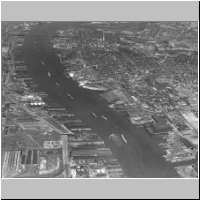 [Delaware River: Port Richmond at left, and terminals at foot of Allegheny Avenue] 1967. Skyphotos. 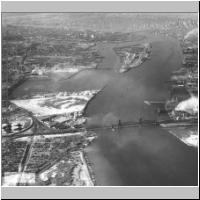 [Delaware River: Port Richmond at right, and terminals at foot of Allegheny Avenue, New Jersey in background] 1968. Skyphotos. 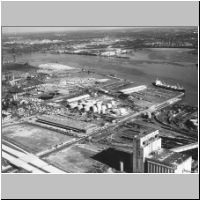 Petty's Island--private industrial property in Pennsauken township--increased in value from 500 guilders ($240) to more than $1 million in 300 years. 1967. Skyphotos. 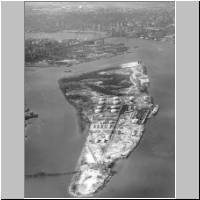 Petty's Island May Be Site. 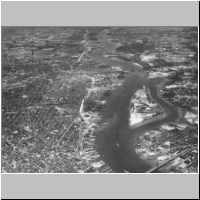 Bicentennial plant propos[ed for] island in the Delaware River. [Published caption] View No. S-1004-19 Date Oct 31 1966 by Skyphotos.